Lindos is probably the most popular resort on the island of Rhodes, located on the east coast at about 47 km from the island’s capital (50 km from the airport) . 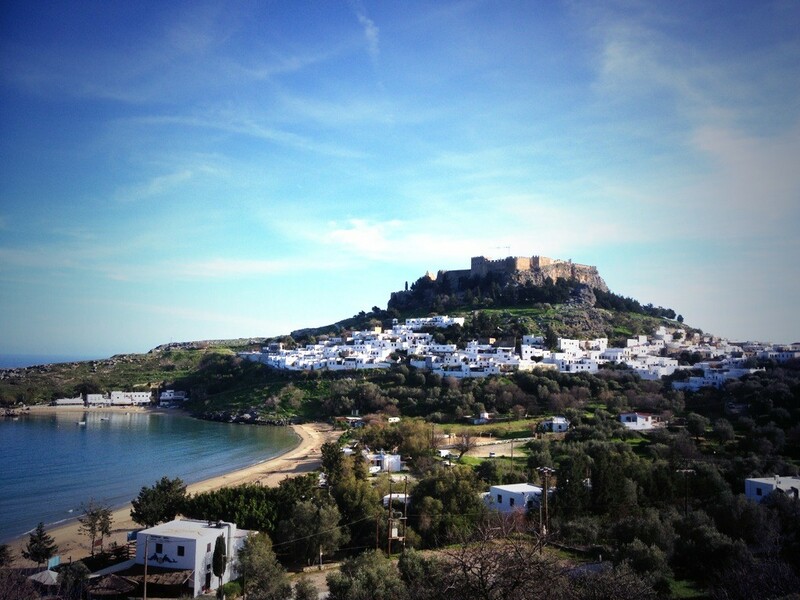 The village, once the capital of the island, today is an attractive holiday resort evolving around the picturesque, whitewashed, preserved medieval village, topped with a fortified ancient Acropolis, reached through a series of steps, which can be ascended on donkeys. From the outside, the Acropolis does not betray its Hellenistic origins because the original complex was surrounded by a strong fortification in the Middle Ages by the Knights of St John, but inside are the Doric Stoa, propylaean ruins, the sanctuary of Athena and the Byzantine church of St John. The ruins of an ancient theatre have been discovered on the slope below the Acropolis. There is a preservation order on the village, building that is very restricted. All the newer complexes are built in the surrounding areas, mainly up on Krana Hill. Many celebrities have chosen to buy or build holiday homes in this beautiful traditional village with cobbled narrow streets and white-stuccoed houses sloping down to the sea.